Root Canal Therapy is often the best treatment choice. When a tooth gets infected through decay, crack or trauma, Root Canal Therapy is often the best treatment choice. Whatever the cause might be, root canal treatment is necessary to save the tooth. This treatment is often perceived as painful and uncomfortable procedure, hence many people tend to avoid and delay receiving the treatment. However, the main purpose is to relieve the pain by removing the infected nerve. If untreated, the infection can spread further to the neighbouring bone tissues and soft tissues causing abscess. In severe cases, it can spread further to different body parts. 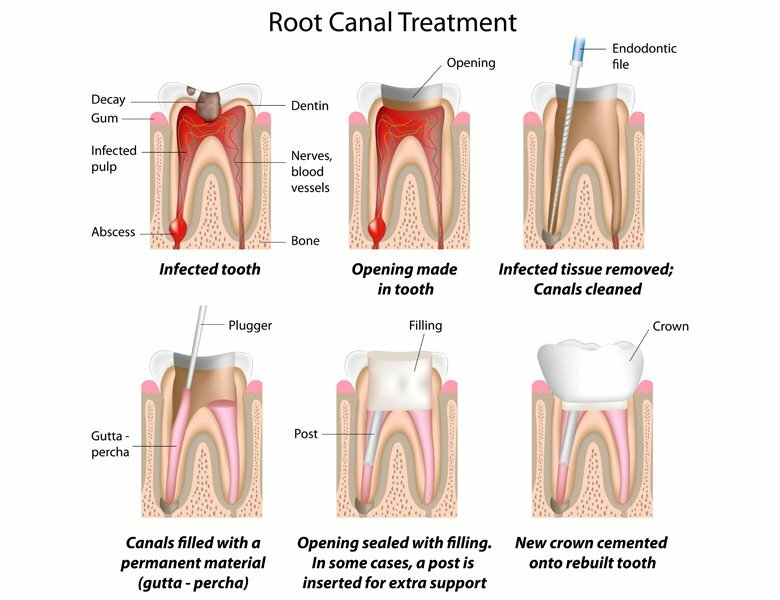 Root canal treatment involves removing the decayed tooth structure and accessing root canal system to remove the infected nerve tissues and debris. Once the canals are accessed, they are disinfected and shaped to be filled with root filling materials (Gutta percha points) and sealed with a restoration on top. For a back tooth where it is under constant heavy forces of chewing, after the root canal therapy, it needs to have a dental crown or dental onlay for further protection of the tooth. Due to the discolouration after root canal treatment, front teeth often require internal bleaching to enhance cosmetics.